"We've kind of turned into a little software company -- just me and my information systems analyst -- and it's become so integrated now into our department operations and our department culture," said Steven Santos, development assistant manager at the county Community Development Services Department. "Whenever we are faced with an issue that needs a technological component, the question isn't can Intellect help, but how." Business users are beating down IT's door for greater mobility and access to information, and among Forrester's predictions for 2014 is that as a result, the business will assume the typical business process management role previously functioning from within the IT department. Los Angeles, CA, November 18, 2013 — Interneer, Inc., a leading provider of Business Process Management (BPM) software for process automation applications, today announced Intellect MobileApps that enables business users and IT to easily build and manage native "Smart Mobile Apps" on any iOS device for enterprise use. Smart Mobile Apps are integrated with back-end systems and enterprise applications, deliver enterprise level security with Bring-Your-Own-Device (BYOD) capabilities. Designed specifically for midsized companies and departments of large enterprises, Smart Mobile Apps improve the productivity and efficiency of employees in the field, and customers, partners, suppliers and others who need access to vital enterprise data on the go. Business process management solutions provider Interneer has introduced Intellect MobileApps that enables business users and IT to build and manage native "Smart Mobile Apps" on any iOS device for enterprise use. Smart Mobile Apps are integrated with backend systems and enterprise applications and deliver enterprise level security with bring-your-own-device (BYOD) capabilities. 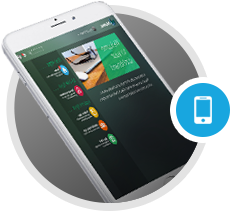 Smart Mobile Apps are designed specifically for midsize companies and departments of large enterprises. Intellect MobileApps is a free container app available on the App Store, and fully optimized for all iOS mobile devices including iPhone 5S, iPhone 5C, iPod Touch, iPad Air and iPad mini. Organizations can build an unlimited number of apps across the enterprise, all accessible within Intellect MobileApps as a library of native apps with access granted to each user based upon individual permissions and security. A provider of sustainable fuels has chosen a business process management (BPM) solution to streamline its operations. Akash Energy will manage its business processes by building smart process applications on top of Interneer Intellect BPM, a rapid development platform, and Interneer’s Intellect MobileApps to create small mobile applications in the field for managing fuel distribution and quality control. The mobile apps will be deployed throughout Akash Energy's distribution chain, from raw material sourcing through delivery to its retail stations, which are expected to open by the end of the year. Interneer Inc. announced that Akash Energy, a provider of sustainable fuels, including biodiesel, ethanol and traditional petroleum based products, selected Interneer Intellect Business Process Management in the cloud to automate numerous business processes and to help streamline operations. Akash Energy will manage all of its business processes by building smart process applications on top of Intellect BPM, a rapid development platform, and will use Intellect MobileApps to create Smart Mobile Apps in the field for managing fuel distribution and quality control. The business mobile apps will be used throughout Akash's distribution chain, from raw material sourcing through distribution to Akash’s retail stations, which are expected to open in the fourth quarter of this year. In 2013, Akash developed an inventory management and invoice processing solution using Intellect BPM that has been integrated into its existing operations. Further, Akash is using Interneer to integrate strategic planning processes into every aspect of their operation. The strategic planning module will link every task to an objective and its corresponding goal, revolutionizing the employee relationship with the company's mission. Tablets and smartphones keep workers connected when they're out of the office, but the focus solely on mobility as convenience is broadening to improve project management, decrease errors in reporting, keep an eye on the competition, save time and, most importantly, money. "Interneer Intellect 7 is designed for mobility, connectivity, and agility. This release extends the platform to enable the business user to develop mobile apps without any programming, unlocking new possibilities that far surpass anything available in the market today." Intellect is Interneer's signature web-based integrated workflow and business process management software solution. It requires no programming from initial design to deployment. Today's update is the first since April 2010, when version 6.5 was released and includes more than fifty feature enhancements. Interneer Intellect 7, with its rapid, no-coding development environment, drives transparent participation and open collaboration among teams, especially business users and IT professionals. Interneer 7 enables business users to easily define, configure, optimize and automate business processes and workflow around common, but critically important tasks or applications, such as "submit expense report", "create contract and proposal," "install user software," etc. "With Interneer Intellect 7, business users in small businesses to large enterprises can benefit from the power of cloud applications and mobile apps to connect and improve business processes throughout the enterprise," said Romeo Elias, Founder, President and CEO of Interneer. "Interneer Intellect 7 is designed for mobility, connectivity, and agility. This release extends the platform to enable the business user to develop mobile apps without any programming, unlocking new possibilities that far surpass anything available in the market today." Humboldt County is a beautiful place, nestled in northern California along the Pacific coast. It's home to breathtaking old-growth Redwood forests, majestic mountains and one of the largest concentrations of Victorian manors and architecture outside of New England. The 134,000 residents who live there enjoy mostly rural landscapes with cool, mild summers kissed by ocean breezes. Steven Santos is the development assistance manager for Humboldt County. It's his job to make sure that permits for both the planning and building divisions move through the system smoothly and quickly. That means that everyone from a major developer who wants to build an entire subdivision to an individual homeowner who needs a new roof comes through his office.